PS4 (Sony PlayStation 4) can be called the most exciting game console in the whole year of 2013. The next-gen console of PS3 has stimulated the appetite of the numerous gamers much earlier than the date when Sony officially announced the release date of PS4 in New York. The PS4 will go on sale on November.15 in the U.S., followed by the U.K. on November 29. The specs of PS4 impress people greatly and are well ahead of any existing game console. Specifically, Sony PS4 features 4K resolution, eight-core X86 AMD Jaguar CPU, 8GB of GDDR5 memory, built-in 500GB hard disk drive, read only Blu-ray drive and even video streaming function. Sony has claimed that demand will outstrip supply dramatically during Christmas holiday season. Undoubtedly, PS4 will continue to play a dominant role in the gaming console field. Can I Play MKV on PS4? It cannot be neglected that PS4 will also serve as a good portable device for video enjoyment. However, PS4 could not play HD videos directly. Thanks to the third-party MKV video converter software, now we could convert MKV to PS4 and play MKV on PS4 right away. This video software can also decode other multi-track 1080P HD video to PS4, for example, transcode M2TS (Blu-ray)/MTS/TS/AVCHD etc to PS4 supported video formats at fast speed. MacX Video Converter Pro is a reliable video converter for PS4 users to convert MKV to PS4 (PS3 and PS Vita included) with high quality, and convert HD video to PS4 for playback. After conversion, the HD video files will be saved as MP4, H.264, WMV or MPEG-2 files which are compatible with PS4. If you want to transfer/import HD video to PS4, PS3, PS Vita or other game consoles, MacX will save you all the trouble. Simply convert MTS/AVCHD video of 1080p, 4K 2160p to PS4 and play HD video on PS4 without worrying about the media incompatibility problem anymore. And all these conversion procedure will be finished within seconds thanks to Intel Quick Sync Video/Nvidia/AMD GPU hardware acceleration tech supports so as to free up your CPU for more video game playing, gameplay recording, etc. Step 1: Load MKV Video Files. Free download this top 1 fast MKV to PS4 video converter on Mac (macOS Mojave included), click "Add File" button to load your MKV file. 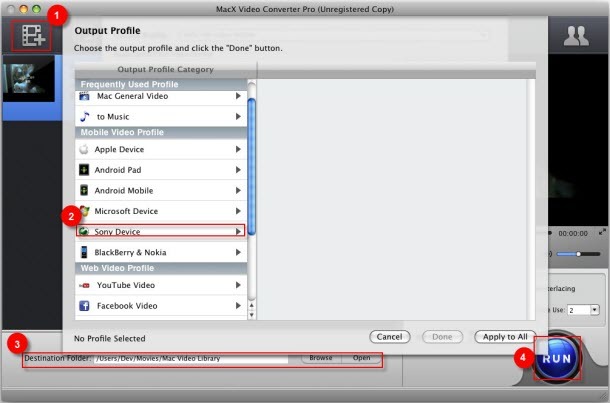 After the MKV video is loaded, you could choose a specific format for the output video. To convert MKV to PS4 for playing, simply select "Sony Device" and then choose PS4 in the profiles. You are also free to choose PS3, PS Vita etc as you like. Tips: The optimized default settings will guarantee the best output quality for you to play MKV on PS4. If you hope to personalize the video, you may also trim the video to remove the black bar to play it on PS4 (PlayStation 4), clip the video length to convert the clips you need for playing it on PS4, and adjust video parameters etc. Step 4: Start MKV HD Video to PS4 Video Conversion Task. Click the "RUN" button at the lower right corner of the interface to begin to convert MKV to PS4 on macOS. 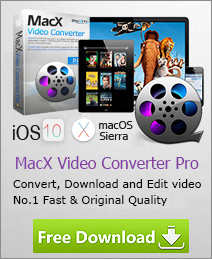 Note: MacX is more than a HD video converter for PS4/PS3 to convert MKV,M2TS ,MTS, TS, AVCHD video to PS4, it is also able to decode and encode regular and HD (4k 8K) videos to AVI, MOV, MPEG, FLV, MP4 for all popular media player, iPhone, iPad, Samsung, HTC, Surface, as well as other best phones and tablets.